Dusk was setting in. The hundreds of candles that had once burned bright had melted upon each other and the candelabra with these candle relics cast a ghostly pall on their surroundings. With only a few lamps illuminating the rooms, it was easy to imagine ghosts lurking in the corner. The effect was enhanced by a face staring at you from the wall, an old writing desk with an old ledger left as if the person working on that decades ago had just stepped out and would return any time. When I saw the old vanity table with a framed photograph placed on it, the thought that had crossed my mind earlier and became stronger was that I might very well be in the ruined house of Miss Havisham in Great Expectations, had she been inclined towards murals. It seemed like a living memorial to the ghosts of the past by the owner, who lives on the top floor of the (guest) house. As we moved across the room, we suddenly heard a thud behind the seemingly black walls off one corner that led to the dark stairs. We peeped down the unlit stairway and saw a black door at the end of it. There was another thud. With the haunted atmosphere hanging in the air, my friend and I scrambled back to the lounge area, which was playing music from the 30s and finished our tamarind juice drinks before leaving Helga’s Folly. I was intrigued however by this first dusk visit to Helga’s Folly, a home turned into an art museum/ guesthouse in Kandy. So, when a couple of friends visiting me in Sri Lanka this month wanted to go to Kandy for the weekend, I decided to explore more of Helga’s Folly with them. Visitors who are not staying overnight at the guesthouse, where the rooms start at USD 100 and go up to USD 500 per night, or dining at their restaurant can walk around the house after paying a tour fee of USD 3 per person. I think it is wonderful that they allow visitors to tour the house and at such a reasonable price because the artwork in the house is truly worth seeing. This time though I chose to visit during daylight, when I could see the murals better and the house had a slightly less haunted atmosphere. What greeted us first as our vehicle climbed up the steep road leading up from the Kandy Lake was the bright red buildings covered with colourful artwork. The house was originally designed in the 30s by Helga’s mother, Esme de Silva. A house that has welcomed famous dignitaries like Mahatma Gandhi, Nehru and Indira Gandhi during its political heydays, given that Helga’s paternal grandfather was Sri Lanka’s first Minister of Industries and Fisheries and her father was the Mayor of Kandy, a parliamentarian and Ambassador of Sri Lanka to France and Switzerland in the 60s. Helga’s parents turned their house into Chalet hotel. However, it is after Helga took over the house a few decades ago, renamed it Helga’s folly and covered it with artwork that I feel it has become a legacy for future generations. It has certainly attracted many movie celebrities, such as Vivien Leigh and Sir Laurence Olivier, and the Folly brochure boasts of its Hollywood heydays as well as the Stereophonics song, Madame Helga, inspired by a stay here. The front office manager handed us a sheet of information on Helga’s Folly before suggesting we start our tour of its interior from the Jane Lillian Vance grotto. So we walked into the front room where the artwork of American artist Jane Lillian Vance covers its walls. Jane Lillian Vance grotto is an amazing art room combining Vance’s beautiful artwork, Helga’s family history as well as a bit of Jane Vance’s personal traumatic story. We retraced our steps past the reception where framed news clippings of Helga’s family line the walls and passed the former office of Helga’s father, Frederick Lorenz de Silva. The office is currently used by the front office manager as her office. We were not able to see the room that Mahatma Gandhi stayed at during his visit, but the friendly manager mentioned that she had been lucky to stay in that room when she first arrived at the Folly. Both times that I visited the lounge area, it had some lovely old French music playing in the background. This time though, I was not able to explore the artwork in this area much as there were other guests seated on all the available couches that I did not feel comfortable walking around them looking at the walls. Anyway, I knew I would need to revisit a few times in order to leisurely appreciate the artwork in each room. A little corridor leading away from the lounge towards the gardens had this little nook, which we decided was a great spot for a group photo. Taking the stairway up to the restaurant area, we came across several dining areas which were set up as private dining spaces. Each seemed to have a different theme and the dining room with the octagonal Taprobane table seemed extra special and perhaps reserved for special occasions. The corridor leading away from the dining rooms and to the guestrooms was covered with black walls. One of the walls had a white tree and red hearts and writing that asked you to add a heart for each beloved soul you have lost. I really don’t think I could comfortably stay overnight in a room in a corridor that was decorated like this. I felt that the house was not haunted, as I initially felt during my first visit but rather had dark vibes of a place that had absorbed the grief, depression and angst of its residents, the owners and its guests. There was a colourful, whimsical corner under the staircase, along the sombre corridor, which lightened its dark overtones. What’s interesting about the place is that the artwork is diverse and at first seems the result of a psychedelic mind. However, you begin to see individual stories emerging and the hand of different artists at work, whether it is in the whimsical or spiritual overtones of the murals. I was informed that Helga’s Folly welcomes artists, writers and senior citizens for longer stays at special rates and the house is certainly a place that seems to inspire the creative. From artists who have been inspired to contribute to the murals to musicians who have been inspired to write a song about the place, it is certainly a place that invokes your emotional and creative response to the visual extravaganza. I left Helga’s Folly with a sense that here was a house that needed preserving for future generations and some maintenance in the present, as it seems to be acquiring a certain dilapidated air about it. I hope Helga and her family consider establishing a trust that will manage it well in the future and continue to allow visitors to tour the place. And, for travellers visiting Kandy city and interested in amazing murals, I highly recommend that you visit Helga’s Folly at 70,Rajapihilla Mawatha, Kandy. Following my visit, I interviewed Helga Perera, the person responsible for creating Helga’s Folly. You can read her interview here. Have you visited a (guest)house that has amazed you with its beautiful murals? 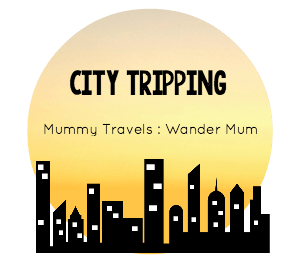 [I am linking this post to City Tripping #38, Wanderful Wednesday, The Weekly Postcard. Thank you so much for your beautiful comment, Katy 🙂 And, yes, Helga’s Folly is a special place. That is a very quirky and totally different find! When I was reading your post at the beginning I thought you were in a haunted house or something. Lol. I can understand not being able to make it to Helga’s Folly with everything else there was to see in Kandy, especially the Temple of the Tooth. Though I had wanted to visit the Folly since I heard of it years ago and have been a frequent traveler to Kandy, I never was able to make the time for a visit here until this year and I have visited it twice already. Their drink and food menu looks good, though I just tried out their tamarind juice, so worth it to have a drink or dine there and enjoy the lovely views from the upper restaurant floor during the day. Would love to meet up with you and your family over coffee/brunch at one of my favourite cafes in Colombo, when you do revisit Sri Lanka. It is indeed a fascinating and unusual (guest) house. Hope you visit the place during your next visit to Sri Lanka, Cathy. The eight year old nephew of my friend, who was also part of the group, seemed to enjoy looking at the artwork as well – at least for an hour. This sounds like an interesting place and not a typical touristy place either. Glad you were able to go back during daylight and take in all of the artwork … even if there were too many people sitting on the couches to really see it all. Thanks, Amanda. Helga’s Folly was an exclusive place that only resident guests, mostly celebrities looking to stay incognito, were able to access. Now, the place is open to visitors who want to tour the place and during our visit, we were free to explore all the public spaces on the two floors leisurely and only the main lounge room was occupied with other guests. Yes, indeed, had I not gone back during daylight, my impression of the house would have been that it was haunted and missed the beautiful art work. Thanks for stopping by, Corey. What a fascinating place! I’d definitely like to visit there but would also like to stay the night. I am sure you would love staying there overnight, Mandy. I have noticed that those who do stay overnight there sound happy about their choice. What an extraordinary place you have brought to life in this post. Look at those candles! And the beautiful strips of wood in the table. I don’t think I could stay there – it would spook me – but a fabulous place to visit and discover its history. Thank you for your lovely comment, Trish. I am sure you would love visiting Helga’s Folly. Urgh that hallway looks scary! Definitely a very interestig and unique place it seems! Haha 🙂 Yes, it is scary, isn’t it? Especially at dusk. During daylight though, the place simply looks colourful and vibrant. Very interesting story, Ahila. Your beautiful writing put me right into the atmosphere of this place. I love the murals too, but I would prefer seeing them during the day time. The idea of a haunted place kind of scares me. Thank you for your lovely comment, Anda! Glad you enjoyed the murals and totally understandable that you would prefer seeing them during the daytime like me. Oh my, I would not feel comfortable in this house. Whilst I appreciate the overall effect, it is just too much colour, texture and form for me. Not relaxing at all, glad to enjoy from a distance via your fab photos! Glad you enjoyed the photos of the Folly. Thanks for stopping by! What a fascinating space. Thank you for taking the time and all the pictures. I visited Kandy long ago and had no idea something like this existed. Thank you, Elaine. Delighted that you find Helga’s Folly fascinating. It seems to polarize people – people either seem to find it fascinating or disturbing. Helga’s Folly is a really cool place to visit. Lovely to hear about your fascination with Sri Lankan murals. Have you visited Sigiriya, where the iconic Sri Lankan murals are? This is so beautifully written I feel like I was there with you! Thank you so much for your beautiful comment, Emma!